The Aztec sun calender is a circular stone with pictures representing how the Aztecs measured days, months, and cosmic cycles. 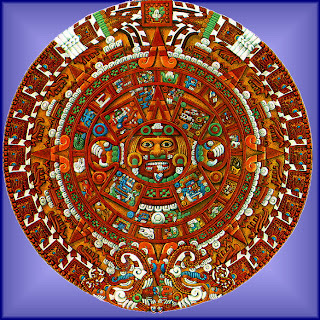 The calendar is evidence of the Aztec's knowledge of astronomy and mathematics. The calendar contained the pictographs for their days, months and suns (cosmic cycles). The stone is 3.6 meters (12 feet) in diameter and weighs about 24 metric tons. It took 52 years to complete, from 1427-1479, it is believed due to the use of only stone tools. This calendar is 103 years older than the Gregorian calendar which is used worldwide today. 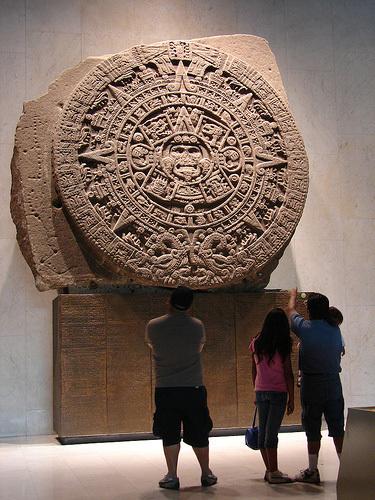 Originally the Calendar Stone was placed atop the main temple in Tenochtitlan, the capital of the Aztec empire. Today, Mexico City's cathedral stands on the site. 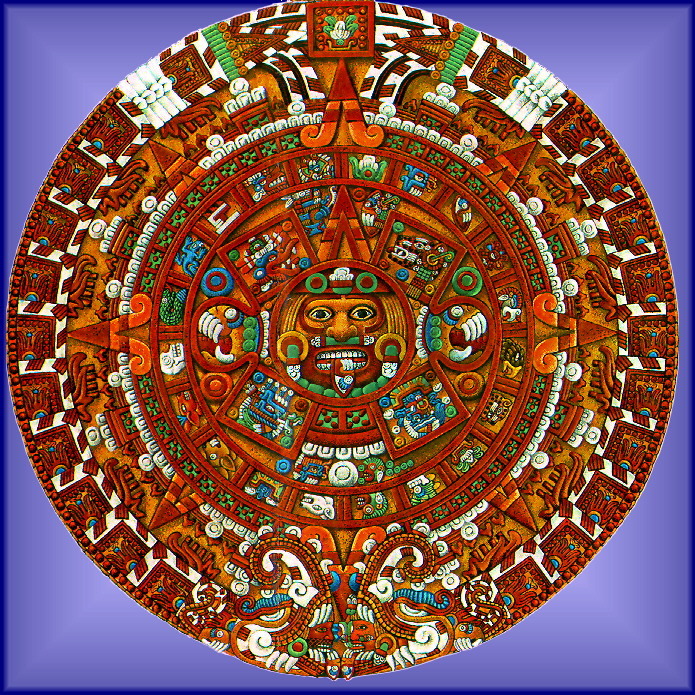 The Aztec calendar faced south in a vertical position and was painted a vibrant red, blue, yellow and white. The stone was buried by the Spaniards when they conquered Tenochtitlan. The stone was lost for over 250 years until December of 1790 when it was found by accident during repair work on the cathedral. Today it is located in the National Museum of Anthropology in Mexico City. The face of Tonatiuh is in the center circle of the stone. Around the face are four squares called Nahui- Ollin, or Four Movement. According to Aztec legend, these squares represented the different ways that the four previous suns (or worlds) had come to an end: first by wild animals, then by wind, by fire, and by floods. The Aztecs believed they were living in the fifth and last world. The Aztec year consisted of eighteen months, each having 20 days. Each month was given a specific name. This arrangement took care of 360 days (18x20), to which five dots were added inside the circle. These dots, known as Nemontemi, were sacrificial days. The next concentric circle is composed of square sections with five dots in each section, probably representing weeks of five days. Next are eight angles dividing the stone in eight parts. These represent the suns rays placed according to the cardinal points. On the lower portion of the stone, two enormous snakes encircle the stone and face each other. Their bodies are divided into sections containing the symbols for flames, elephant-like trunks, and jaguar-like forelegs. 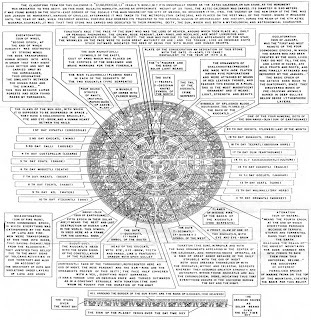 It is believed that these sections are also records of fifty-two year cycles. A square is carved at the top of the calendar between the tails fo the snakes. Inside the square the date 13 Acatl is carved. This corresponds to 1479, the year the calendar was finished. Eight equally spaced holes appear on the very edge of the calendar. The Aztec placed horizontal sticks here and the shadows of the sticks would fall on the figures of the calendar; thus the stone also served as a sundial. An artist's representation of how the Stone of the Sun may have looked when painted. 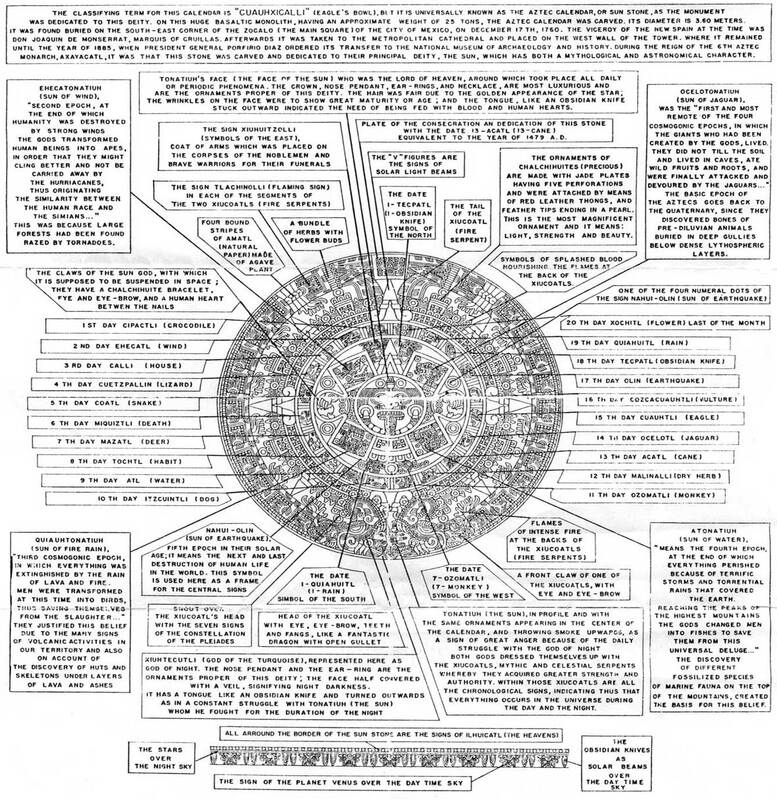 A very detailed synopsis of the meaning of the carvings on the Stone of the Sun.